Can your child swim? Being able to swim is a life saving skill, especially living near the sea. For over 20 years, FAB volunteers have run the Balfour Swimming School for our Balfour children. Supporting absolute beginners through to advanced levels, our sessions are run on a Saturday morning and after school on a Thursday (during term time only) at Surrenden pool. Thursday sessions: 2nd May to 11thJuly, excluding 30th June for half term. Saturday sessions: 4th May to 13th July, excluding 1st June for half term. Sibling discount applies if payments are made before 20th May. If confirmation of your child’s place is not received by 28th May, it will be offered to the waiting list. Payments for Summer term due by 20th May………..term starts on Thursday 2nd May/Saturday 4th May. The Balfour Swimming School is run by FAB volunteers. 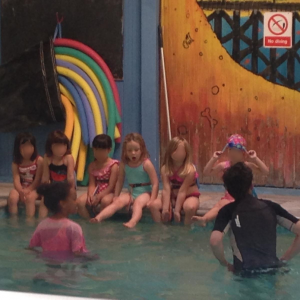 Our swimming teachers also teach in other Brighton swimming schools. Swimmers are divided into three abilities; beginners, middle and confident, within these bands are swimming stages 0 to 12. Each lesson runs for 30 minutes – swimmers need to be changed and ready to enter the pool at the start of the lesson. If your child is a non-swimmer we have ‘rocket packs’ that are used instead of armbands, these attach to the swimmer’s back and provide flotation without interfering with their arms. In the beginners group there will be a minimum of two trained personnel in the pool, this will be the teacher and a trained helper. All our trained helpers and teachers are CRB checked and have the relevant swimming qualifications to support and/or teach. Please do not bring your own flotation devices or leave valuables in the changing rooms. Payment for the lessons are made on a termly basis. The lessons cost £5.50 a session, this covers the cost of pool hire and teachers and the remaining amount goes to FAB and is spent on trips, activities and equipment to enrich our children’s time at school. An “early bird” sibling discount applies if paid before the deadline date. BACS is the preferred payment method, although cash and cheques are accepted. Our sessions are popular, especially the beginners groups. So it is likely that new starters will be put on a waiting list and you will be informed as soon as a place is available. In your child’s first lesson, they will be assessed regardless of any previous experience and the teacher will then move them to the right time slot or ability group if necessary. The children are continually assessed throughout the year to monitor their progress. When your child passes a stage or is able to swim a new distance, you will be offered the opportunity to purchase a badge and certificate; these cost £2.50 each and are a fantastic way of marking their development.